At the London Olympics in 2012 Team GB achieved a third place finish in the medals table. A key factor in this achievement was the high standard of contemporary British sports coaching. But how has British sports coaching transitioned from the amateur to the professional, and what can the hitherto under-explored history of sports coaching in Britain tell us about both the early history of sport and about contemporary coaching practice? A History of Sports Coaching in Britain is the first book to attempt to examine the history of British sports coaching, from its amateur roots in the deep nineteenth century to the high performance, high status professional coaching cultures of today. 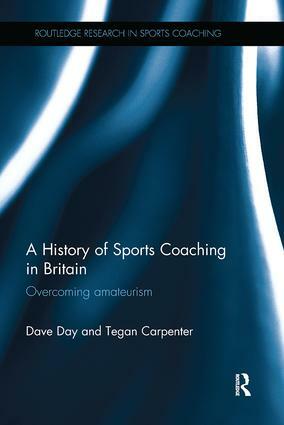 The book draws on original primary source material, including the lost coaching lives of key individuals in British coaching, to trace the development of coaching in Britain. It assesses the continuing impact of the nineteenth-century amateur ethos throughout the twentieth century, and includes important comparisons with developments in international coaching, particularly in North America and the Eastern Bloc. The book also explores the politicisation of sport and the complicated interplay between politics and coaching practice, and illuminates the origins of the structures, organisations and philosophies that surround performance sport in Britain today. This book is fascinating reading for anybody with an interest in the history of sport, sports coaching, sports development, or the relationships between sport and wider society.